Like the star quarterback of a football team, a company’s resource management system plays a pivotal role in mission success as the technical force behind every practical play. Resource management is the development of project support through identifying what’s needed, project to project. Types of aid might focus on anything from financial strategies to staff acquisition, as well as the effective allocation of these resources. The burning question: How can you ensure optimal field-strategy for your players? 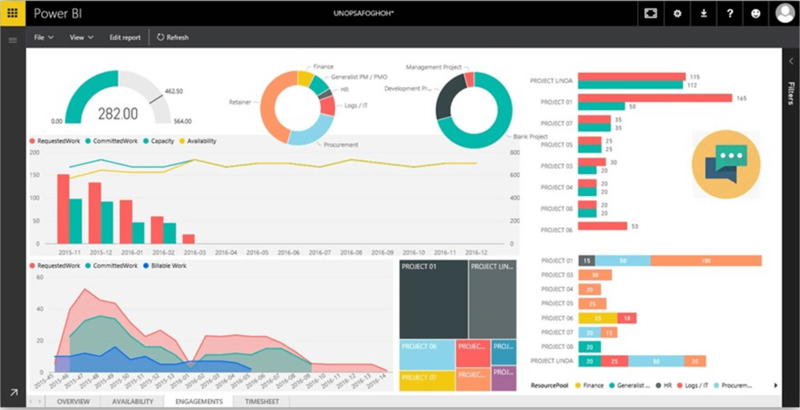 Industry-specialist Allan Rocha most recently teamed with The United Nations Office for Project Services (UNOPS) to build their resource management strategy using Project Online and Power BI. Drawing on his experiences and expert-insight, he details the steps you can take to improve resource management for your team. Rocha advises organizations to strategize a series of plays that incorporates core elements of resource management: roadmap, levels and dimensions, technology alignment, and business drivers and benefits. Many successful plays remain at your disposal; the tricky part is recognizing which applies to your team’s specific needs. According to Rocha, Project Online content pack for Power BI has transformed the decision process. As a result, he was able to apply the Resource Management Maturity Model to the UNOPS pilot. This system analyzes the failure and success records of other organizations, providing a more focused, mature model that identifies what areas require improvements. Their team ranking: Clarity of project objectives allowed UNOPS to focus work and energy more effectively. Your team ranking: Using Project Online and Power BI will help you access a flexible online solution for your Project Portfolio Management (PPM) and daily office tasks. Even the best players fumble every now and then. In multi-level office management, the worst detail to overlook is also the easiest: alignment of terminology. Without a unified language formation, misunderstandings flood the field. The solution? Familiarize your team with industry terms that explain the following common subjects: resource capacity, resource utilization, resource allocation, resource demand, tasks and governance. This inter-office alignment ensures your team will have ongoing success communicating key project initiatives. Comply with the regulations specific to your company’s paradigm. The UNOPS trial used Office 365, one of the most expansive and reliable cloud platforms. The UNOPS sample used Project Pro for Office 365 and Project Online, a versatile tool that covers an array of industries such as retail, finance and healthcare. The UNOPS pilot applied Microsoft Excel / PowerPoint and Power BI, a visual analytics tool that integrates information obtained from external engines such as Bing and Google. In resource management, your PPM represents both offensive and defensive lines, and Project Online ensures clear visibility on the field. Using Project Online in tandem with Power BI easily renders business intelligence reports, graphs and charts visually available. Rocha’s pilot for UNOPS is the technical force behind their practical mission. Saving lives and helping cultures across the globe is just one application of these powerful resource management tools. As an industry professional, your mission matters. Resource management moves your mission toward the end zone—Project Online and Power BI help you score. Allan Rocha has dedicated his career to portfolio and project management. For nearly 12 years he has been working with the Microsoft PPM Solution. He has no commercial purpose with United Nations Office for Project Services (UNOPS). For more information on his resource management strategy with Project Online and Power BI click here.